Summer flowers have had a reputation for being bright and bold throughout history, but things are changing. While certain flowers will always be associated with the warmth of the summer sun, others fade in and out of style. Because flowers are such a fantastic birthday gift, summer bouquets are in high demand. This guide will help you select a fresh, modern birthday bouquet for anybody you have on your gift list. This year, you can expect to see a change in the way flowers are gifted. Gone are the days where just any floral bouquet could do. Today, the focus is on selecting the right flowers. Not only should flowers be modern, but they should also be appropriate for the atmosphere of the occasion. Dahlias are going to be hot this summer thanks to their versatility and number of different colors available. The most popular dahlias are considered those with the “cafe au lait” coloring. These flowers are creamier toward the middle and more white toward the outside. Red and blue are also lovely dahlia colors for the summer months. Red wine may be popular, but the color of red wine is also on the rise in the floral industry. People love pairing colored flowers based on their favorite palettes. Dusty rose and soft pastels are also “in.” Essentially, anything with a red, pink, or coral tint is in high demand this season. Seasonal flowers that look fresh from the garden are also becoming much more popular. People love the backyard wildflower look. There is much more to selecting flowers than looking at the blooms themselves. For one, you have to consider the venue you are considering. Mood and atmosphere are essential components of flowers. Sunflowers are perfect for a seaside event, especially because they are among the most recognizable flowers in the world. The colorful flowers blend well with other outdoor venues. The sunflower symbolizes loyalty and longevity, which also makes it casual and fun -- just like a beach birthday party! Eustoma is perfect for an urban atmosphere. It is simple but beautiful, offering a subtle bloom perfect for any occasion. Eustoma blooms are also symbolic of happiness and excitement, making them the ideal for birthday bouquets. For a garden setting, tulips are ideal. These flowers have a reputation for being elegant no matter the color you choose. Each color also has symbolic meaning so that you can choose the perfect tulip based on your relationship with the birthday boy or birthday girl. Yellow tulips are cheerful while red tulips symbolize true love. Next time somebody you know is having a birthday party, take a few moments to consider where the party is being held. This may influence which type of flower you send or bring to the big event. This is just one more way to show that you care. Selecting the perfect birthday flowers takes time. You want to find a bouquet that has meaning, and you want to choose flowers that are in style. Fortunately, we know exactly which flowers will please anybody you are shopping for this summer. The Sunflowers Bouquet is the perfect encapsulation of summer joy. Six stems of sunflowers rest on a bed of gorgeous foliage to offer a sweet summer scent. Does any other flower really express that summer excitement the way the sunflower does? 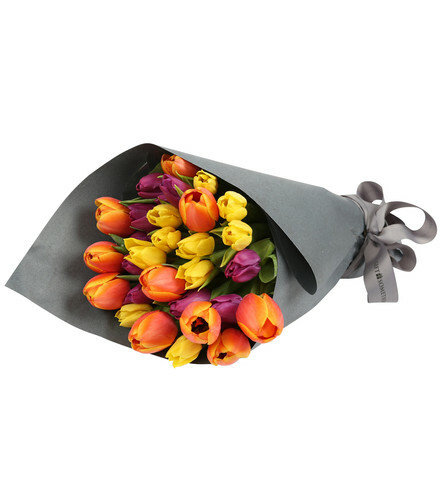 We love the Colorful Tulips Bouquet, which offers 20 to 24 stems. Tulips arrive in a variety of colors, offering a joyful burst of color and are perfect for those early summer birthday parties. The Mixed Eustoma Bouquet is a lovely combination of purple and champagne blooms. The colors pair well with each other to create an elegant combination that makes for a beautiful home decoration. Our Garden of Eden Bouquet looks fabulous as a summer gift. The mix of blue hydrangeas, white ranunculuses, yellow roses, yellow tulips, white tulips, and hyacinth if simply gorgeous. This bouquet offers a little something for every flower enthusiast. Summer birthdays make for easy gift giving experiences because there are so many glorious flowers to choose from. This is the perfect time of year to shop for birthday flowers because so many gorgeous trends develop following the spring weather.